It is common knowledge that bus operators prefer passengers buying their tickets well in advance. This allows operators to optimize their capacity, pricing, and improve operational efficiency. At the same time, there are situations where onboard sales is inevitable or recommended for commercial reasons. In this article, we will cover both the negative and positive aspects of onboard sales. Additionally, we will talk about the prerequisites of successful deployment and management of such sales channel. Should you implement onboard sales or not? When it comes to onboard sales, our experience shows that operators around the world treat it differently. There are operators who have historically sold tickets on a bus and the passengers are so used to this that the operators don’t dare to ignore that sales channel. On the other hand, there are operators who have reduced onboard sales to a minimum by pushing passengers to buy tickets in advance with attractive online sales tactics (channel based pricing, low prices for pre-booking, dynamic pricing, etc). One of the main arguments we often hear against onboard sales is that it causes delays in schedules. The reason behind it - drivers need to handle the sales and payment process while tickets bought beforehand only need validating. Another solid argument that we mostly hear from developing countries is fraud. Low-paid bus drivers can be more susceptible to stealing the cash collected from the passengers. On the other hand, those regions are also known for low penetration of digital sales channels, creating a bit of chicken and egg situation. But let’s be honest, the key influencer regarding the share of onboard sales is the filling dynamics of the bus. The more people are worried that they will not get a seat on a specific departure, the more they are willing to pre-purchase tickets. The main reason why onboard sales could be something to account for is that there are always people who will buy tickets in short notice. Thus, it’s not a question if such additional income stream exists but rather what’s the size of that additional income versus the effort needed to establish it (time, reserved seats, etc.). Fortunately, the effort decreases and eases rapidly thanks to emerging new technologies. This is why many operators who have at some point stopped their onboard sales are now re-evaluating the decision and possibly re-opening this opportunity. For every rational operator, the main goal is to sell as many seats as possible for every departure. 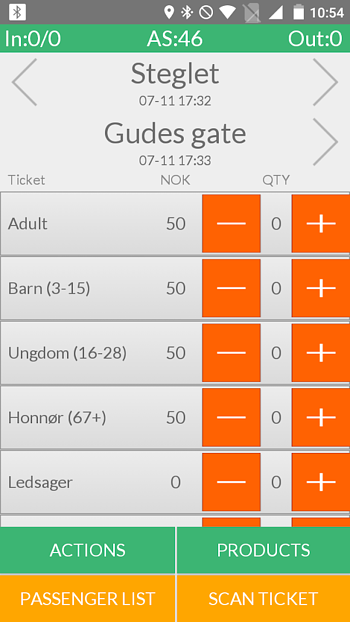 On the other hand, operators don’t necessarily know in which sales channel passengers will be buying their tickets from. Thus, it is crucial not to limit available seats in any of the sales channels. Be it onboard sales or pre-sales. One of the principal prerequisites for a successful onboard sales strategy is the ability to keep a tight record of sold and available seats and synchronize the transactions with the central reservation system in real-time. The existence of such a system also enables implementation of demand-based logistics. 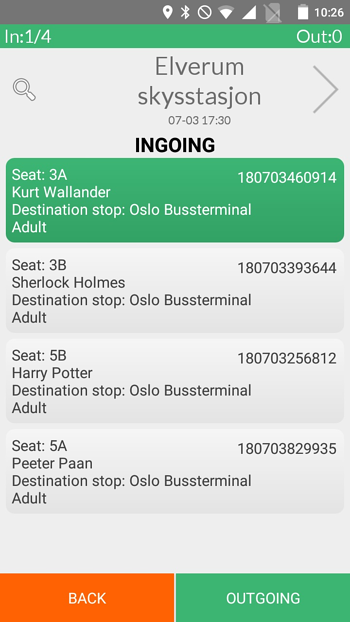 It means that the passenger can be confident that even five or ten minutes before his trip he can notify the bus driver that he wishes to board from a specific bus stop. The bus driver then knows that he has to make a stop there but can drive past without stopping, if there are no passengers waiting. It’s a great compromise between the ability to sell more without significant delay in schedule. The times when the ability to perform onboard sales meant that you have to invest thousands of dollars into large and cumbersome proprietary hardware are over. Today you can very successfully establish onboard sales with a few hundred dollar Android phones. And better still, the same device will take care of digital and accurate check-ins, vehicle tracking etc. The advantages of a smartphone-based solution are obvious – it’s modular, simple to use, upgrade and integrate with necessary peripherals. For example, integration with card payment terminals, printers or WiFi routers. Also, updating the software is easier and faster than with legacy hardware. All those advantages are actually very easy to prove. Think of Uber – it’s the same technology but in the hands of a bus driver. All in all, this technology results in significantly lower cost and entry barrier to enable onboard sales. Depending on the size of the bus operator, the investment to teach drivers the necessary processes for onboard sales can be a sizable investment. Thus, the simpler and easier the UI for the drivers is, the smoother learning curve will be and thus, the investment, too. This, of course, again speaks of the benefits of smartphone-based solutions, because even the most senior drivers have used smartphones in their daily lives. Depending on the type of bus operator, the usability of onboard sales and in particular, the speed of it, can be a matter of life and death. For example, shuttle and commuter type operators have historically had a much larger share of onboard sales because they operate on high-frequency lines where inventory management is unnecessary. In those cases, keeping up with the schedule and the profitability of the line depends significantly on how fast the bus driver can sell tickets to all waiting passengers. There are countries with laws in place for tracking cash transactions to reduce tax evasion. Different countries have different fiscal rules and technologies. For example, in Latvia, each device used for sale must be equipped with a fiscal memory device, which acts as a tamper-proof black box that stores all transactions. Such fiscalization greatly limits the choice of equipment, since many of the more affordable (like Android phones) devices don’t have the option to integrate such dedicated memory blocks. 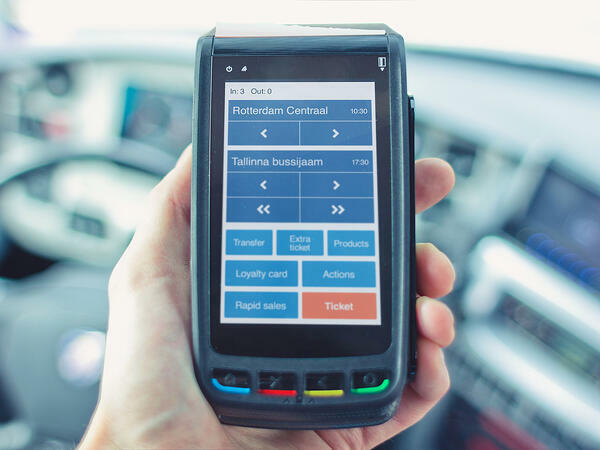 Thus, in Latvia, bus operators are still forced to use technologically and morally obsolete cash registry devices developed more than 15 years ago. Meanwhile, in Croatia, fiscalization is solved by using only software-based crypto algorithms to prove the originality and authenticity of transactions. Also, all encrypted transactions are sent to the cloud-based tax administration server. With such a solution, it is still possible to implement Android-based onboard sales, although it needs some additional software development. Intercity bus service sits by principles in the middle of travel and public transport industry. Sometimes there are cases where intercity bus line crosses regions or stops where it acts as a local commuter service. In such cases, to simplify regional ticketing interoperability, local authorities have implemented a smart card-based fare collection system, which must be supported by intercity operator’s own reservation system. Depending on whether the system is account- or card-based, the complexity of the implementation will affect the investment. Depending on the local laws and the preferences of passengers, a paper-based ticket should or must be printed when selling a ticket on board. This poses some challenges in hardware selection as none of the consumer smartphones have a printer. Use a wireless mobile printer, which is connected to a smartphone via Bluetooth. Use an Android device with an integrated printer. Yet, we must advise choosing carefully as most devices are Chinese niche products, which might have implications for long-term support and driver compatibility. If possible, use card payment terminal’s own printer to print tickets with. This would, of course, require a consent and respective interface from the issuer of the card payment terminal and application developer. We at Turnit strongly recommend thinking about implementing simpler smartphone-based onboard sales. In the modern world, a driver must digitally check-in the passengers anyway. Thus, why not use the same device to earn extra income while improving the customer experience? Especially when technology has become increasingly affordable and easy to use.